50 States, 50 Obamacare Horror Stories: Who's Lying Now, Harry Reid? Home > Politics > 50 States, 50 Obamacare Horror Stories: Who’s Lying Now, Harry Reid? Harry Reid is a dishonest bag of garbage. Back in February, you may recall that the douchiest member of Congress took to the Senate floor to publicly condemn the recent anti-Obamacare ads that the Koch brothers put out. 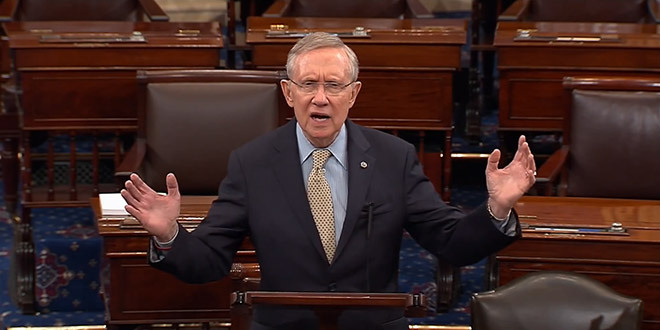 In Reid’s Senate speech, he dismissed all claims made by the Obamacare victims featured in the videos as outright lies, and called the Koch brothers “un-American” for producing the highly critical campaign ads. Despite all that good news, there’s plenty of horror stories being told. All of them are untrue, but they’re being told all over America. All of those horror stories are untrue? Lies? Not so fast. The Washington Free Beacon has released a video response to Senator Douche-Nozzle’s remarks. The video is called “50 States of Obamacare Victims” and highlights real actual horror stories, one from each state, of people who have been adversely affected by the disastrous Obamacare legislation. 50 states, 50 stories. If you watch the video, it is easy to see that the Obamacare victims are not the ones who are telling tall tales.